Risks are always associated with every workplace. Industrial accidents occur in all the industry and it not only creates unexpected personal grief, but also a financial loss and negative publicity of the organization and industry concerned. It is possible to create a safer and less environmentally harmful workplace to reduce the number of incidents that affect health, safety, and the environment by understanding their cause. Thus, industries, therefore, started to give a very high priority to health, safety, and environmental protection. NIST Institute PVT LTD which has nearly a decade experience in the field of HSE training has brought the consciousness and importance of HSE among the professionals and acting as a boon for many Industries across India and other countries. NIST Institute PVT LTD deals with health, safety and environment (HSE) for professionals who aspire to excel in their career for past seven years and to those companies looking forward to HSEQ (Health Safety Environment Quality) standards. NIST is one of the foremost global health safety course providers of NEBOSH, IOSH, British Safety Council Certification (India) Private Limited) courses. NIST Cochin is known for their record of batches and high ranking percentage. 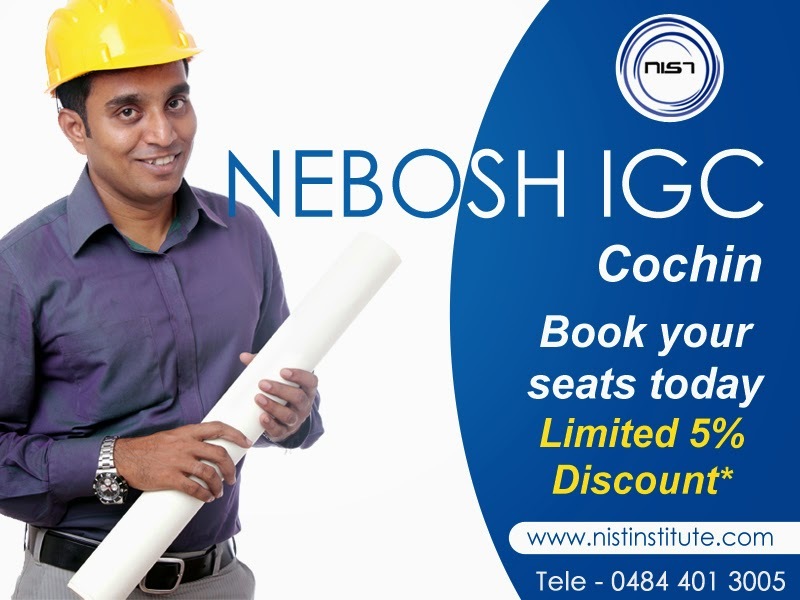 NEBOSH courses in Cochin is a golden opportunity for the industries and people in the localities of Kerala. The number of safety professionals is being developed each year with NEBOSH courses in Cochin. As Cochin is the industrial capital of Kerala, NEBOSH courses in Kochi are very well recognized among the professionals and fresher. More than 65 registrations per NEBOSH IGC batch is a proud achievement that we make till date in NIST Cochin. NEBOSH IGC (International General Certification), NEBOSH IOGC (International Oil & Gas certificate), NEBOSH IDIP (International Diploma in OHS) and NEBOSH Fire Safety. IOSH MS (Managing safety) and IOSH WS (Working safety). British Safety Council Fire Safety and Risk assessment. NIST is in its triumph path establishing their branches across India and in other countries.